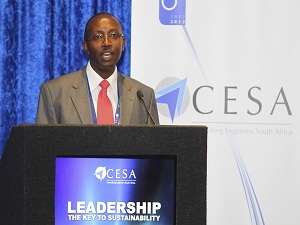 At the Consulting Engineers South Africa (CESA) AGM held at the CESA Conference in Cape Town on Monday 11th November, Abe Thela from Nyeleti Consulting was appointed as President of the organisation for the next two years. What can we do as consulting engineers to sustain our industry? And what should the government do to sustain consulting engineers and the economy? Abe Thela is a civil engineer with over 20 years’ postgraduate experience, mainly in consulting civil engineering. He completed his schooling in Soweto and matriculated in 1984. In 1982 he was selected to attend a pilot phase of the organisation called Programme for Technological Careers (Protec), which started in Soweto. It was during his participation at Protec that he was exposed to various technological careers including civil engineering. He enrolled for a degree in civil engineering at the University of Witwatersrand and graduated in 1988. His interest is in municipal services provision and infrastructure development for the betterment of the lives of all South African communities. Abe is a principal and an executive deputy chairman of Nyeleti Consulting. For the past five years he has served on various committees of CESA. “My theme for the coming year will be presented, as is customary, to the media at the Annual CESA Media breakfast being held during February 2014 and then presented to all our member firms at our Presidential visits following on from this.